What if you could train your body to burn fat more efficiently and speed up your metabolism without restricting calories? 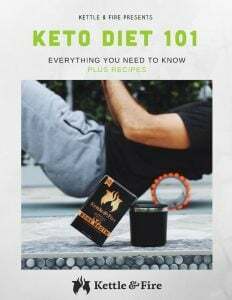 If you’re struggling to lose those last 5 pounds or wondering why the muffin top just won’t budge (despite eating clean and exercising), you may find the answers you’re looking for in this keto diet master guide. The ketogenic, or keto, diet is a high-fat, low-carb diet that puts your body in a natural fat-burning metabolic state called ketosis (1). The keto diet is often grouped with other high-fat, low-carb diets such as the paleo or Atkins diets. But the reason these diets boast fat-burning benefits in the first place is because they promote ketosis. Therefore, the ketogenic diet isn’t so much a diet, but moreso the basis of these diets, and the biochemical reaction that occurs when you train your body to burn fat for fuel instead of carbs. While the ketogenic diet has become popular for weight loss, studies have also shown numerous other benefits of following a keto diet. It may help reverse Type 2 diabetes and reduce symptoms of Alzheimer’s disease, depression and autism (3)(4). The keto diet was first used in the 1920s not as a weight loss diet, but a natural treatment to prevent seizures in epilepsy patients (5). Let’s look closer at how the ketogenic diet can promote fat-burning and increases energy levels, plus other benefits. In order for your body to burn fat for fuel, you must remove the majority of carbs (in most cases, 90 to 95 percent) out of your diet and increase fat intake. Why? In the case you do run low on glucose, your body will switch gears and begin converting stored fatty acids to ketones, which can be used as a secondary energy source (8). This is why the ketogenic diet is known to support weight loss. Instead of starving yourself, you’re training your body to burn fat for energy. Weight loss isn’t the only reason to follow a ketogenic diet. Let’s look at some of the other benefits. The brain can only use two types of nutrients for fuel: glucose and ketones (11). This is why, despite information that states a certain amount of glucose is needed per day for optimal brain function, a keto diet can actually support cognitive function. In fact, some people report improved focus, concentration and mental alertness when they enter ketosis. A high-carb diet (especially when it comes to dairy products and refined sugar) has been shown to trigger sebum (oil) production in the skin. Removing sugar from your diet may also support skin health. The healthy fat intake on the keto diet also provides the building blocks for skin cells (12). We’ve discussed why the keto diet supports fat loss, but another way it promotes weight loss is by balancing your blood sugar levels, which reduces cravings for carbs (13). Since high fat foods are also richer and more satiating than carbs, you’ll also feel full with smaller portions. Some studies suggest ketosis can increase your metabolism by causing even more calories to be expended during the fat-for-fuel burning process (27). In order for the keto diet to work, you’ll need to know if you’re in ketosis or not. There are several ways to measure ketones in your body. You can find keto strips at nearly any drugstore and online through Amazon. Ketone breath analyzers allow you to measure your state of ketosis by detecting acetoacetates. A popular brand is Ketonix, which is a rechargeable ketone monitor that can be used over and over again. There are many different ways to follow a keto diet. Here are the four of the most common. The SKD generally includes 5 percent carbs, 20 percent protein and 75 percent fat. The high protein ketogenic diet is close to the standard ketogenic diet, but with a higher ratio of protein. The macro count for the HPK diet is roughly 5 percent carbs, 35 percent protein and 60 percent fat. This form rotates ketogenic days with high carb days, usually five ketogenic days followed by two high carb days. Sometimes referred to as ketogenic carb cycling, this version of the keto diet can help promote fat loss and muscle-building. On high carb days, your body will leave a state of ketosis — but these “carb refeeds” may better promote muscle growth than the high protein or targeted keto diet, since glycogen is the nutrient that “feeds” muscles (15). Ketogenic carb cycling is also said to be less of a lifestyle stressor for some people, as the two high carb days make the CKD feel less restrictive and easier to follow. Since each person has a different body fat percentage and nutrient requirements, there is no one-size-fits-all caloric or macronutrient rule for getting into ketosis. For example, athletes who train four to five times per week will still be able to enter a state of ketosis by eating a higher percentage of carbs, compared to someone who’s mostly sedentary. If you’re not already a keto pro, you can calculate your personal optimal macronutrient ratios by using this ketogenic calculator. What Foods Are Off-Limits on a Keto Diet? So…what can you eat on the keto diet? The answer is: Plenty! 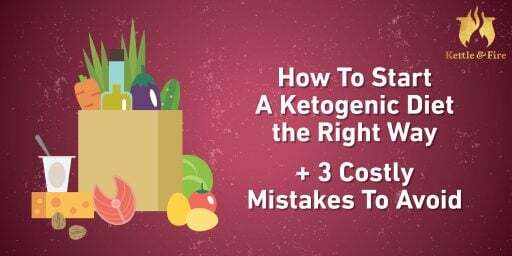 The easiest way to get started on a keto diet is to stock your kitchen with keto-friendly foods, and get rid of any foods that may tempt you into deviating from your keto meal plan. If you’re looking for keto recipes, we’ve got you covered. 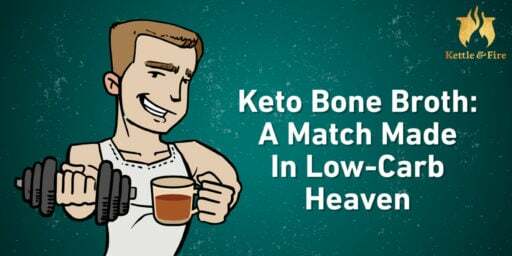 Dishes like slow cooker beef bone broth and keto pizza can fit into just about anyone’s meal plans. If you’ve recently adopted the keto diet, you may be feeling a variety of side effects including nausea, dizziness, constipation, headaches and irritability. This is your body’s natural reaction to removing carbs from your diet, and we promise the symptoms are temporary. Also known as keto flu, it’s a natural reaction that occurs when your body switches from burning glucose as energy to burning fat. Ketosis is sometimes mixed up with ketoacidosis, which is a dangerous health condition that can turn your blood too acidic and lead to serious health problems, including death (16). Ketoacidosis happens when your body fails to produce enough insulin. On the other hand, when done properly, nutritional ketosis can improve insulin function. A word of caution: If you’re starting a new dietary plan, it’s best to consult a professional about your options. Armed with knowledge, your keto food list and plenty of keto recipes, you should be ready to give the keto diet a try!